This is the app you are looking for… It's only every so often we take a quick break from movie news to tell you about a cool movie-related app for your mobile phone. With Comic-Con underway this week, it's no surprise that Lucasfilm is making sure to make a mark. Their first big launch includes a brand new Official Star Wars App, which actually looks very sleek and contains an impressive amount of features. It's not overly cheesy, thank goodness, or so overwhelming it's hard to navigate. It's available for iOS + Android and even includes a news feed for Star Wars updates (hey you don't have to read us anymore!) and notifications. To download, search the store or click these links - iOS: strw.rs/1CmmGkj | Android: strw.rs/1TlRshK. 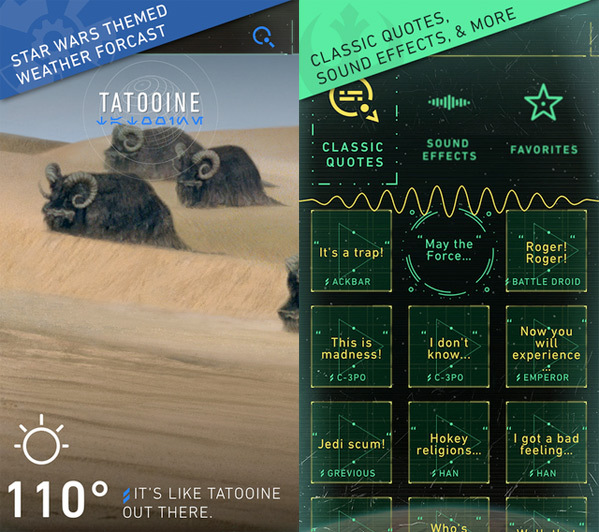 The app itself covers everything from Star Wars news to themes and interfaces including "Light Side, Dark Side, or Droid" to weather forecasts to lightsabers to a Star Wars "selfie" platform. So much more: "Share animated GIFs with your friends and family of memorable scenes and characters from the Star Wars movies and TV shows, including Star Wars: The Force Awakens and Star Wars Rebels. Discover behind-the-scenes fun facts with This Day In Star Wars History. Play classic sound clips and sound effects from your favorite Star Wars characters, creatures, weapons, and scenes." I'm a long time iPhone user myself, and I'm always on the lookout for apps that well-made and useful. Glad to see Lucasfilm putting some effort into this one. Cool! I remember when these were super popular in the 00's. This is the 2000's. The first decade of the 2000's. ...I've got some bad news for you. You mean this is actually 3015? 00s, 10s, 20s, etc. He didn't say 2000s, just 00s to indicate the first decade. Do you prefer aughts? He couldn't have meant the 1900's. Phone apps, let alone phones didn't exist. And he obviously couldn't have meant the 3000's. Now there's trailers for apps? Lord help us. Why is this not available in the UK? Tried to download but is not available in the UK. WHY!!!! !